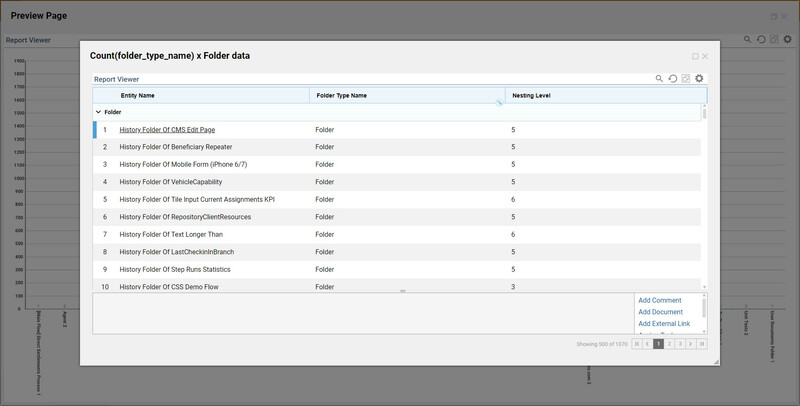 Report data in a Report Viewer can be summarized in a variety of formats. 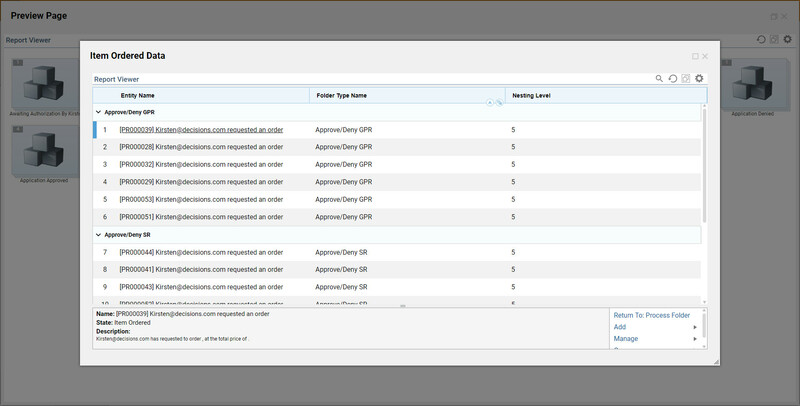 This customization allows users to select the Data Drill View	they wish to utilize when the Portal Page is viewed. 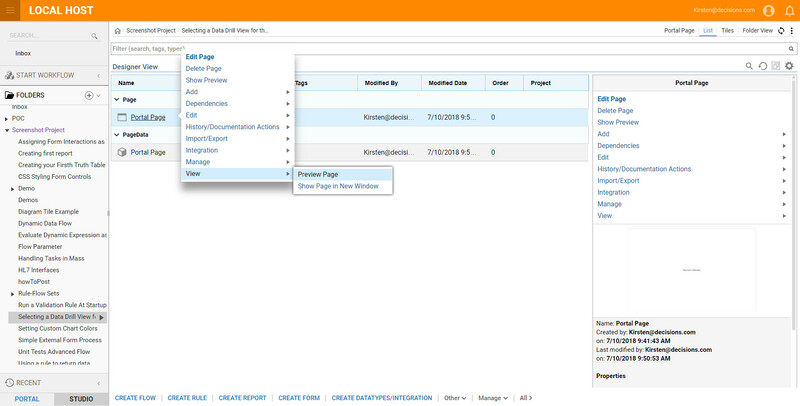 Create a portal page, and add a Report Viewer	to it. Set the default report to display in the Report Viewer	. Select the desired View Mode	options. 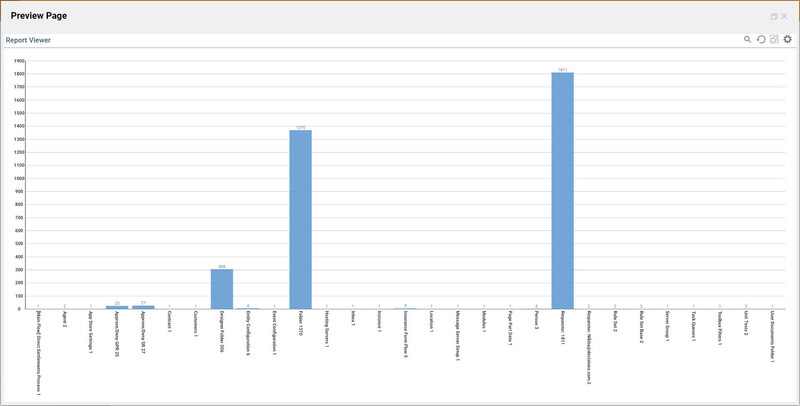 Select the Data Drill View	mode, and view the results in the Report Viewer	. 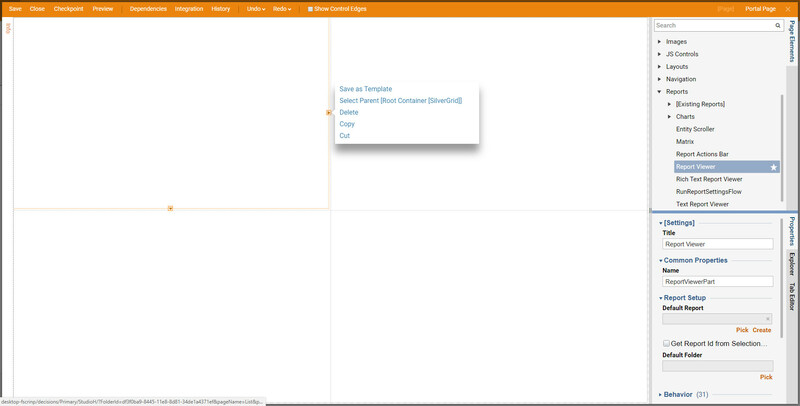 To begin, navigate to a Designer Folder	and select Manage > Page > Add Page	. 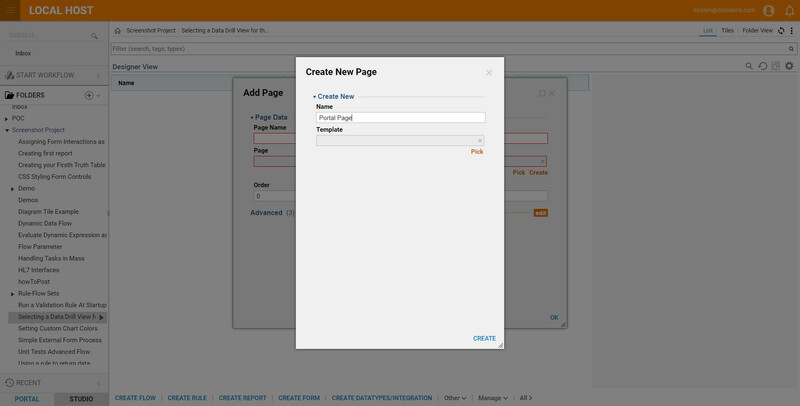 In the resulting dialog, name the page and click CREATE	. From the Page Elements	, expand the Reports	category and drag a Report Viewer	component into the workspace. To set the report to be displayed when the user opens the page click the Default Report	selector button found in the Behavior	section of the Properties Panel	. 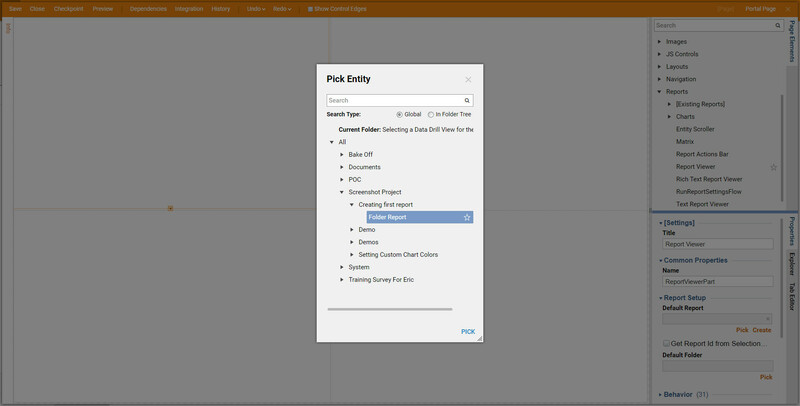 In the resulting Pick Entity dialog, select the desired report and click PICK	. Now that a report has been selected, the data drill settings can be changed. 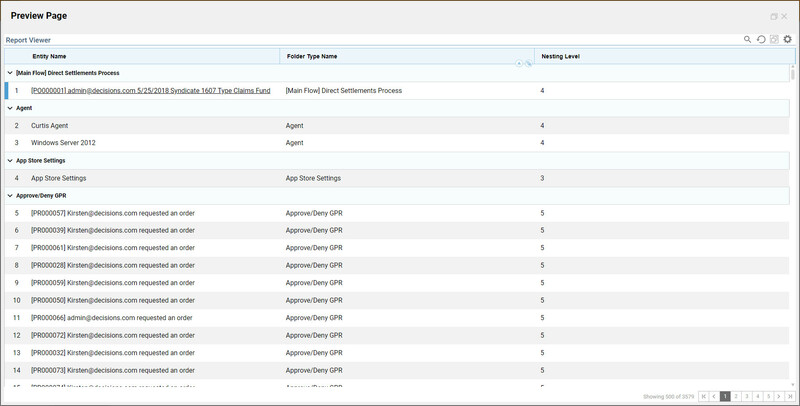 In the Properties Panel	go to the View	section and select the desired output options from the View Mode	list. Note: to use the Calendar	, Charts	, and Matrix	options, the report selected must be configured with these options. 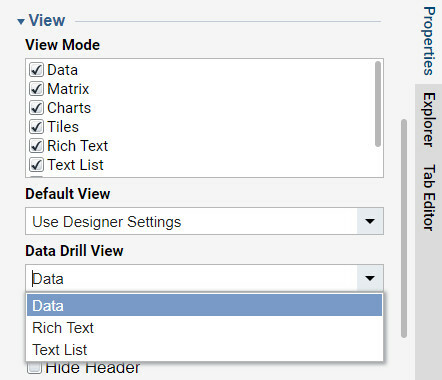 Also in the View	section, the user can select the Data Drill View	from the items in the drop down list. This sets the view mode to be displayed when the user drills down into a report. The page is now complete. Save it and close the Page Designer . To view the report, click on the page’s thumbnail and select View > Preview Page	from its Action	menu. The report opens in a new window and is displayed in one of the selected output options. By default, if Data	is selected, the report will always be displayed in the grid view mode. 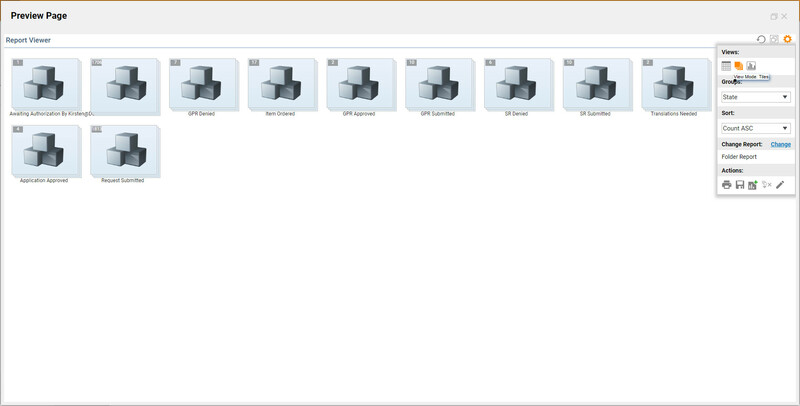 To change the output view mode, select the corresponding View Mode	icon found top left of the Report Viewer	. Once the View Mode	has been selected, clicking on an individual entity in the report allows the user to drill down into the report. The information regarding the entity is displayed in the Data Drill View	mode selected in the Page Designer . Notice, the user can manually change the drill down view by selecting one of the available buttons at the top left of the pop-up window. Selecting other report view modes will give the user the same option to drill down into the report. 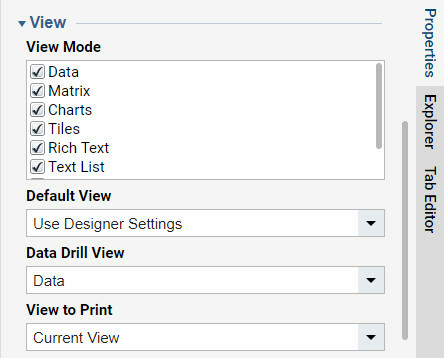 Again, the data is displayed in the format configured in the Page Designer , but the user has the option to change the view manually.